You may have heard it through the grapevine, but Bond International is back on our streets, even if it’s only for Christmas. The London store recently opened a new East London location on Cheshire Street, stocking a wide selection of big brands including The Hundreds, Mishka, Obey and Rogue Status, just in time for the holiday season. 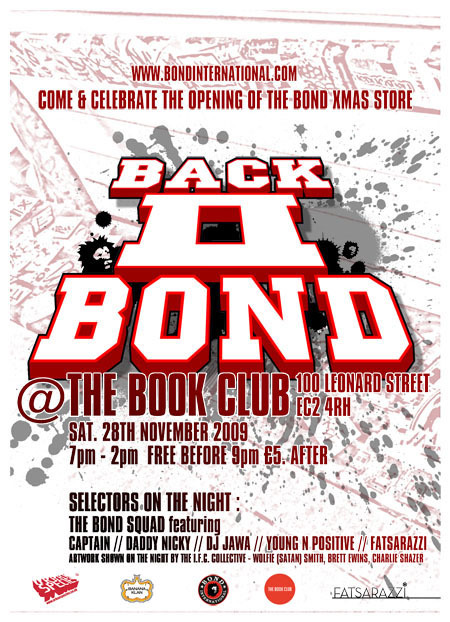 To celebrate this fact, Bond will be hosting the ‘Back II Bond’ party at The Book Club, only a short walk away from the store. There will be a bunch of DJs and also a selection of artwork on display from various artists. Full info is on the flyer above – It’s going to be a real good night, and I’m sure all of London’s street wear elite will be in attendance, so make sure you don’t miss out.